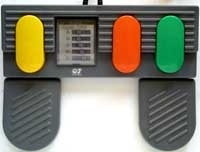 The Footpedal is a video game accessory designed by QJ. There are at least three different versions - one for home computers, another for the Nintendo Entertainment System, and one for the Sega Mega Drive. No versions appear to have been released outside of Europe. All three Footpedals have the same outward appearance. The Footpedal is a device for controlling games via your feet - a precursor to analogue pedals often seen with video game steering wheels. QJ's Footpedal is entirely digital and has three very large coloured buttons along with various switches to configure the device. It is designed so that the user can plug a different controller into the Footpedal and control the game as normal, making the footpedal an optional extra. The Footpedal works best with racing games - if the user is forced to hold a button to accelerate, this can be quite awkward on a traditional joystick setup. It has less of a use with consoles, as the layout of a gamepad is far better suited to racing games, but still stood as one of the only options for emulating real-life car controls. The Mega Drive version of the Footpedal is the only version in the set to make use of the three buttons, and there are retractable supports at each side for comfort.